As if the cold, wet snow and trees struggling to open their leaves isn't enough to remind me it is spring in the Adirondacks, the arrival of the Iron People who come to Lake Placid for training camps reiterates the message. That message is: if you are a wimp, do not go for a road bike ride in an Adirondack spring rain/sleet/snow storm. I shudder when I see those folks on their bikes, hunkered heads down, against the wind and biting sleet, speeding down the steep hills on NY State Route 73. Just watching them reminds me how bad it feels, so I stay off my bike until the sun is shining. Since I am a wimp and so many Adirondack spring days feature cold, rain, snow and sleet, and no skiing, I have more time for a vigorous yoga practice. Speaking of snow and yoga, this past Monday's yoga class was supposed to be held on the dock on Lake Placid the lake, as shown in today's featured photo. 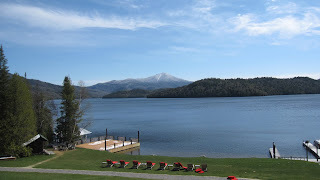 As you can see, it would have been a chilly practice, so we moved inside to a room with full length windows facing the lake and Whiteface Mountain, which made for a wonderful and warm yoga class with a view. I have enjoyed yoga in some stunning locations during my 29 years of practice, but this spot at the Lake Placid Lodge in Lake PLacid, is one of my favorites.